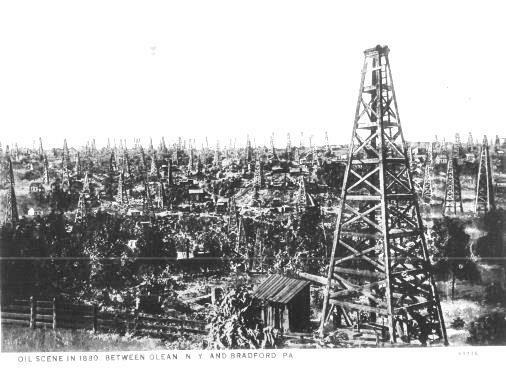 Shows the Chipmonk Well just after it was "shot"
The oil boom that swept Pennsylvania also struck Allegany. 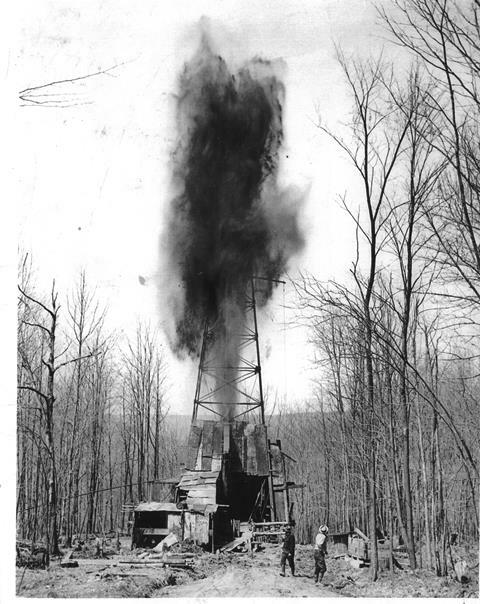 Drilling for oil began in 1875 and the fhe first commercial well in the Allegany township was drilled at the head of the Four Mile Valley in 1877. Oil was discovered in Chipmonk in 1895. The first well there pumped 400 barrels a day. The first photo shows the Upper Four Mile Valley in 1880. Knapp Creek is in the upper left of the picture. The derrics were wooden at this time. Notice the number of derricks in the area. The second photo shows an oil well in Chipmonk just after it has been "shot". The date is unknown but since the derrick is metal, not wood, this well was drilled after the big oil boom is over.